Mowing the yard this summer has been a daunting task. Not that it’s been harder, but what I see around the yard while mowing reminds me of work needing to be done. You can tell from the photo below I really dislike weedeating. Mine is electric and I have a very long yard, which means running a long and annoying extension cord. I also get really sore the next day. Minimizing this task in anyway is very important to me in yard maintenance. Last year I planted these Red Twig Dogwood Shrubs and Forsynthias. 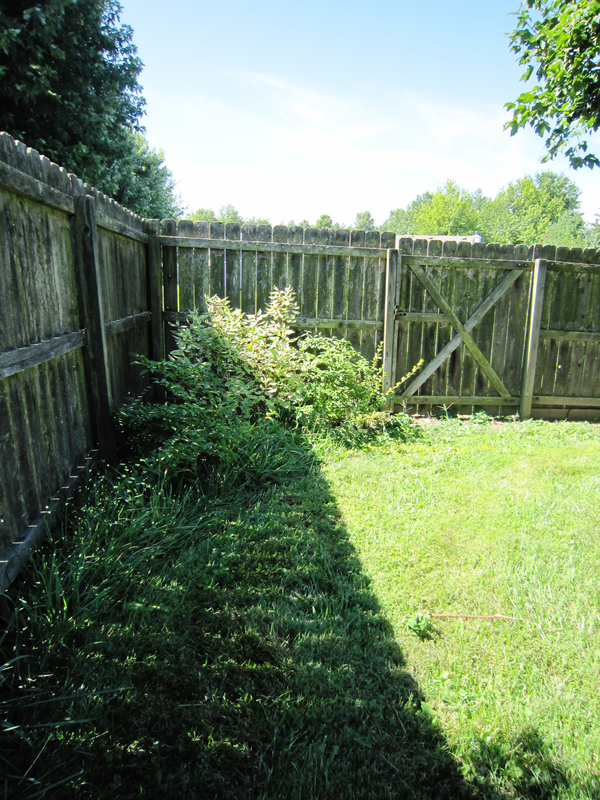 I didn’t think it would be very hard to mow or weedeat around these shrubs, but I was way wrong! It is really important to create good edges and borders in your garden. The investment in time and money will go a long way in keeping it maintained and looking good over time. You can do a multitude of designs in creating borders. They can be as simple as making a edge with mulch, or you use stone, wood, or metal to create all kinds of bordering designs. A book like Fine Gardening Beds & Borders can help you visualize options and installation. A sharp edging tool and a flat garden spade will help out a lot when doing this type of work. My very helpful boyfriend suggested we spend some working together in the yard. I was really excited to have the help of someone very knowledgeable. First we he used a garden edger to mark a line where the sod would be cut. He then made perpendicular cut lines every foot along that marked edge which helps get the sod up in sections. He used the really sharp edger to scrape off the layer of sod and weeds. This saved a lot of the soil from being dug up (and from having to be moved). I used a flat sod shovel to begin along the back part of the area. The removed sod and grass was placed at a low spot in the side yard to help level it. After the sod was cut out, the edger was used again to create a well trenched sharp edge. The soil was tapered and leveled to create a slight slope going from the bed to the edge. This will help keep sod and weeds from growing back in to the bed. One thing we noticed while pruning the shurbs was how the Forsynthia was growing. The ends of some of the branches had gotten covered by grass, old leaves, and soil. These branches were beginning to root and spread. After some research, we found that they will do this if covered by any organic matter. Forsynthias originate from China and beginning to show signs of being invasive. I’m not into letting that happen, so the Forsynthias are going to be monitored and pruned. They will perhaps be replaced later on by some native shrubs. This is the other corner. It should be easy to mow with that curved line! We also worked on the area next to the gazebo. 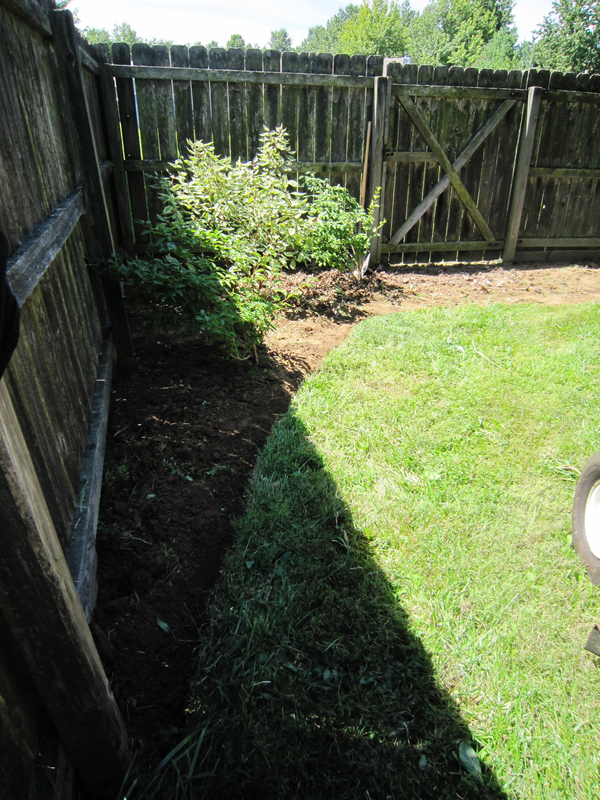 I had worked on this area little by little, digging sod as I needed to make space to plant shrubs and flowers. However, it was getting hard to mow around the red maple. It’s very important not to allow the mower to nick any tree roots. This can invite disease and cause some serious issues with the tree like causing it stress or stunting its growth. We needed to be careful digging sod around the tree so we didn’t cut or nick any of the tree’s roots. We used a hand shovel or just pulled the grass by hand nearest the roots. We used the edger to de-sod the edges to create a good line. 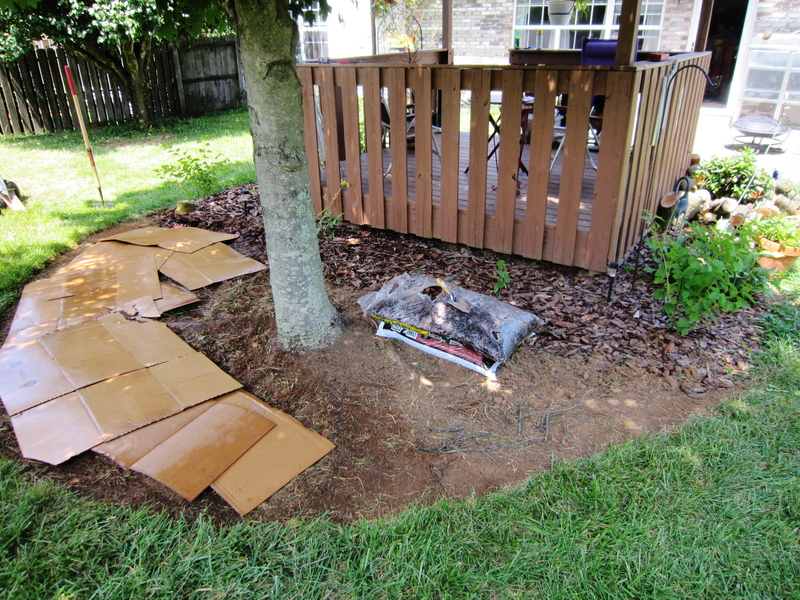 Then we layered cardboard in areas it would be too hard to de-sod by shovel. This method works very well and the cardboard will give back to the soil once it smothers the grass and decomposes. It also saved a lot of time and energy! We layered on mulch really well. 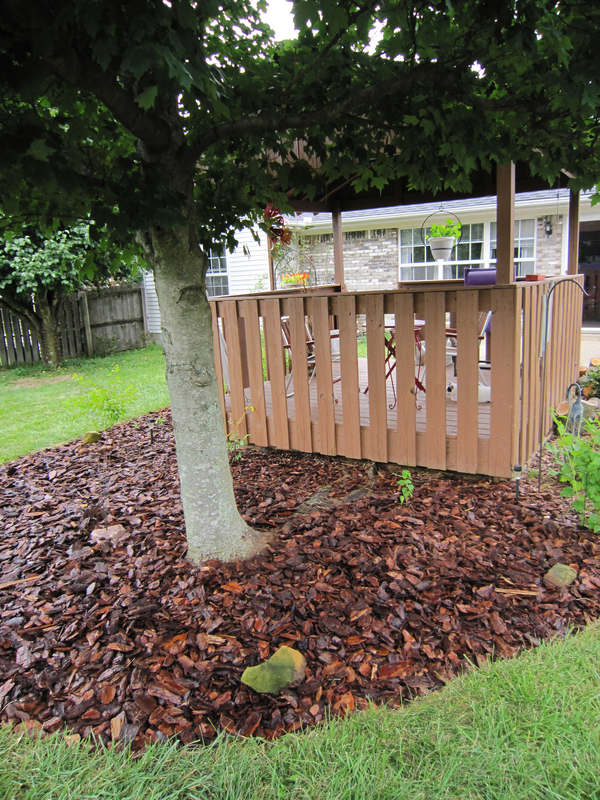 It’s important to get mulch thick which will help block out weeds. Removing the sod around the tree will also allow its roots to breathe better. This tree had been showing some signs of stress at the beginning of the year. Hopefully it will be happier and not seed as heavily. Plastic sheeting or garden fabric simply does not work. Put your dollar into the mulch. You can often call the city and get mulch for free at certain times of the year. Lastly, avoid using mulch that has been dyed. Over time as it begins to settle and get flat, the dye creates a chemical barrier which seems to cause water to roll right off of it. It’s also pretty nasty for the soil, and will dye your hands and clothing. Look carefully on the packaging and observe how its contents appear. Brands (like Naturescapes) who sell it are also usually more expensive. Here I used Pine bark.